Los Angeles commercial and residential architect Dan Brunn has had a banner year. The recipient of multiple awards, including an honor for Interior Design’s Best of the Year, Brunn’s work is garnering industry accolades. With a successful 2017 coming to an end, he’s facing his biggest challenge to date: Designing and building his own green home. Brunn’s home is called Bridge House. It’s a unique 4,500-square foot rectangular structure that stretches over a creek in Los Angeles’s historic Hancock Park. “The build is adventurous and that’s exciting, but it’s my own house, so I have more time to question everything,” Brunn said. 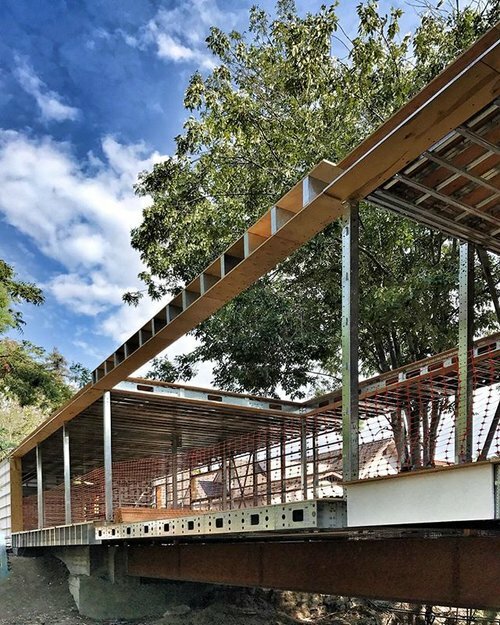 Currently, the support structures are in place, and when complete, the house will scale the creek effortlessly, as if it were part of the landscape. Bridge House will be Brunn’s first solar home. He plans to use it as his primary residence and as a showcase for his business and all of the sustainable products he’s using to build it. Because its components are hidden, SunPower panels rest seamlessly on any rooftop, a feature that supports Brunn’s minimalist aesthetic. “One of the biggest reasons I chose SunPower was because of design. It’s the simplest, cleanest home solar out there,” Brunn said. Brunn ascribes to a design philosophy he calls “purposeful modernism.” He aspires to design buildings and homes where nothing can be removed because everything has a purpose. “You don’t see the mechanics of an iPad, so why should our homes be any different?” Brunn said. Step inside a Brunn home, such as “Hide Out” or “Flip Flop,” and you’ll notice the absence of hardware and other mechanical technologies. In their place, you’ll find the smooth surfaces and clean lines that define minimal modernism. Brunn’s design philosophy resonates with SunPower’s, and it’s through similar guiding principles that the SunPower Equinox solar system was developed and launched almost two years ago. It’s by design that the panels have backside microinverters, that the wiring is hidden within the installation, and that the panels fit perfectly in our proprietary InvisiMount® Racking System. With SunPower Equinox, only the surface of the panels is visible and with precision mounting, they look like they’re floating on the roof. A SunPower Equinox system is just one of Bridge House’s many complementary and eco-friendly features. Part residence and part product showroom for Brunn’s architecture business, the home will showcase many other green building technologies. It’s being built using BONE Structure® an innovative steel framing technology specifically designed for net-zero efficiency. It will also be outfitted with high efficiency, fully connected Bosch home appliances, from its water heater, to its kitchen stove and even its surveillance system. And with a rooftop SunPower Equinox solar system, all of these electric appliances will be powered with electricity made from the sun. Construction of Bridge House is slated for completion in August 2018. In the meantime, Brunn has his hands full with the day-to-day business of building his home and running his business. Even so, he still finds time to envision the future of our homes and cities. “I imagine a future of smaller, efficient homes with more land for people to enjoy and retail stores built for hospitality rather than transactions,” Brunn said. If Bridge House is any indication of what’s to come from Brunn and other forerunners of modern architecture, the future looks beautifully efficient, innovative and sustainable. 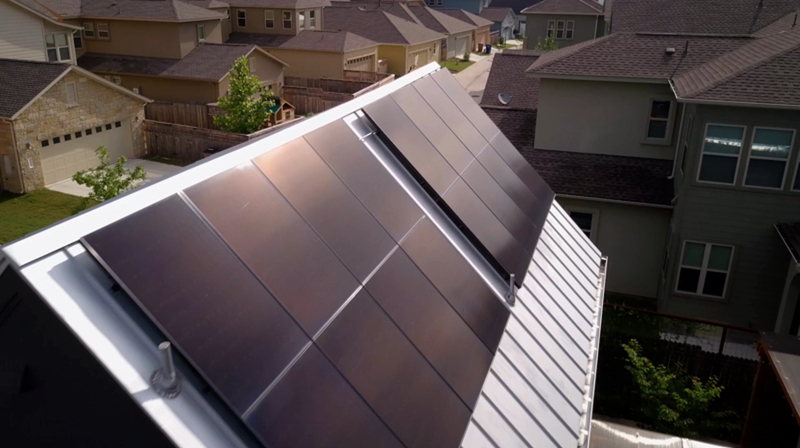 SunPower will chronicle Dan Brunn’s journey as a solar homeowner on our blog and social media channels. Follow us on Facebook, Twitter and Instagram for photos and videos of this innovative home building project. Follow the Bridge House LA and DBArchitecture on Instagram for more behind-the-scenes stories.